What isn’t he? Nosy, like you bastiges. Since having read timbuys’ comment yesterday to the effect that Gil Thorp may be a constrained comic, I can’t shake that idea out of my head. So much so, in fact, that I’m sorely tempted to constrain my TWIM posts for the remainder of this arc to haiku form. What say ye? 2. Wait, so dude is a cornerback and not a safety?? I’d rather see our punter work on the coffin corner. I never realized until now how morbid that term is. I wonder where that term originated? Well, I briefly left my post hanging while I looked it up. Something to do with air flight. It is apparently dangerous so the pilot is putting himself at peril and anyone on board . Risking ending up in a coffin I suppose. If anyone has better information, correct me if I’m half-baked. Its just a post and not a bleeding book. @Jive Turkey, so the Wikipedia article on the Coffin Corner pretty much gets it right: there is a point in an airplane’s flight envelope where the combination of increasing altitude and/or increasing speed will cause a dangerous stall. You’ll note this is also the origin of the phrase ‘pushing the envelope’. 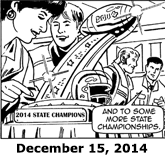 Say what you will about today’s strip but you can’t deny that the date is placed about as prominently as possible. It is October 24th and Gil Thorp wants you to know. I agree that Whigrub is showing signs of having read too much Nancy Drew. I know I shouldn’t get into speculation about this plot, but I do keep thinking of Ted Pearce. I suspect the little sister is some kind of special needs child and that the family is fighting poverty to take care of her. Some aspect of this causes Tiki to be late for school. This requires us to think that the team is concerned about his welfare rather than just being snoops. But this does take us to the similar Aaaron Aaagard plot, which ended with Aaaron living with a teammate’s family while his mother was in opiod rehab. Warning: Do Not Stare Directly Into The Giant 10/24.